Farewell Kobold Quarterly & Level Up! 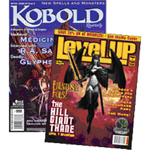 A short note to let you all know that I have decided to stop representing Kobold Quarterly (published by Wolfgang Baur) and Level Up! Magazine (published by Goodman Games) in order to pursue other opportunities in 2010. If you would like to advertise in either of these great periodicals in the future, you will need to contact Wolfgang Baur and Joseph Goodman, respectively. I want to thank everyone here that I’ve been able to meet because of my time representing these magazines, and I especially want to thank Wolfgang and Joseph for their friendship and the opportunity to work with them. This entry was posted on Tuesday, December 29th, 2009 at 08:00 and is filed under Featured. You can follow any responses to this entry through the RSS 2.0 feed. You can leave a response, or trackback from your own site.